I can hear some say yes and nod their heads :). Even those who haven't tried yoga before, have probably heard of it. Yoga has been known as a unique set of exercises, derived from the ancient practices in India, aiming at finding the balance for our mind, body, and soul. Even more, yoga offers more "as a way to discover the sense of oneness, with yourself, the world and nature," as quoted from H.E. Narendra Modi, the Prime Minister of India. And the 21st of June has been declared as the International Day of Yoga. 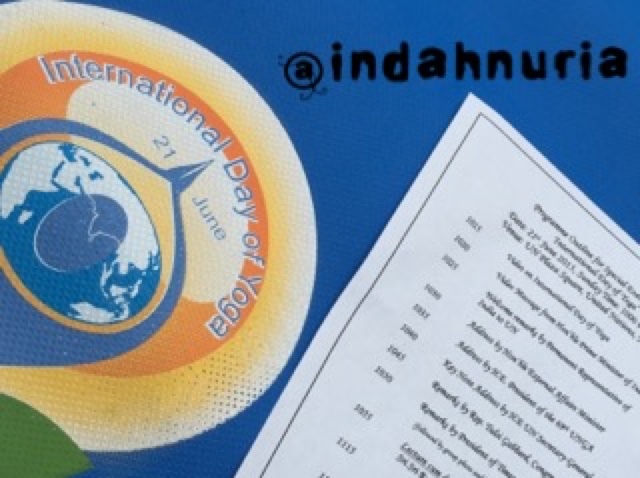 With the unanimous adoption of the UN Resolution on the International Yoga Day, June 21st, which happens to be the solstice,-the longest day during the year, is declared as one. With solid supports from 175 Member States of the UN, GA Resolution 69/131 was successfully adopted. And last weekend was the first inaugural of International Day of Yoga. The celebration took place at the United Nations Visitor Center as well as at Times Square. Bo, Obi and I decided to come to the UN and Bapak dropped us there. It was a bright sunny Sunday indeed and as we arrived there, many have taken the seats and mats provided for the first celebration of the international day of Yoga. I was lucky I could squeezed myself in there between the students while Bo et Obi happily sat in the reserved section. The celebration started with many speeches, I have to say :). 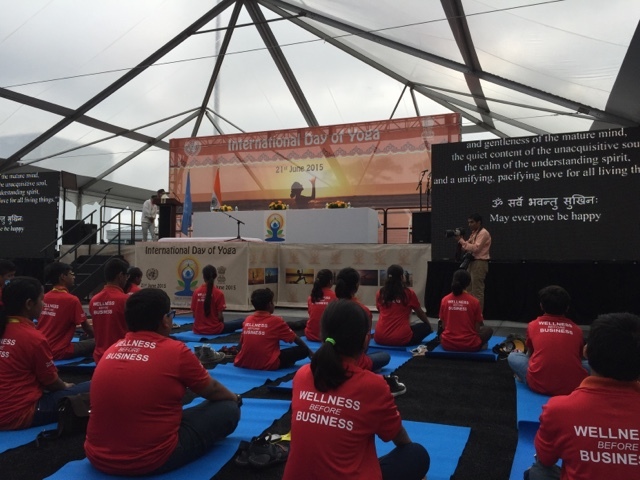 With dignitaries like the Indian Minister of External Affairs, the 69th UNGA President, congresswoman, and the UN Secretary-General, the proceedings highlighted how yoga has and will continue to bring health, joy, peace and happiness to humankind. 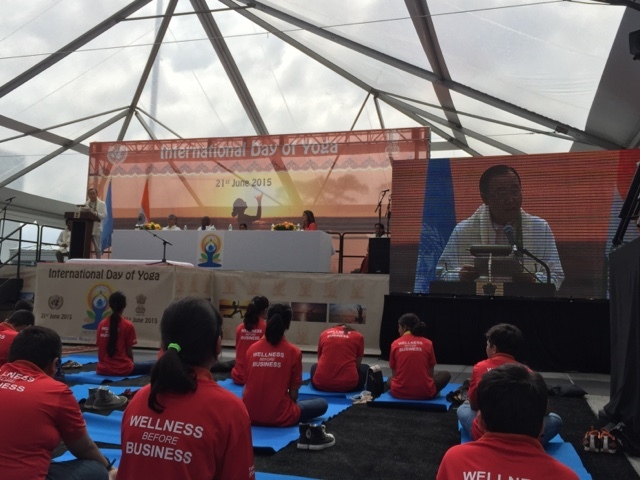 We also saw some videos showcasing the beauty of yoga and its endless benefits. 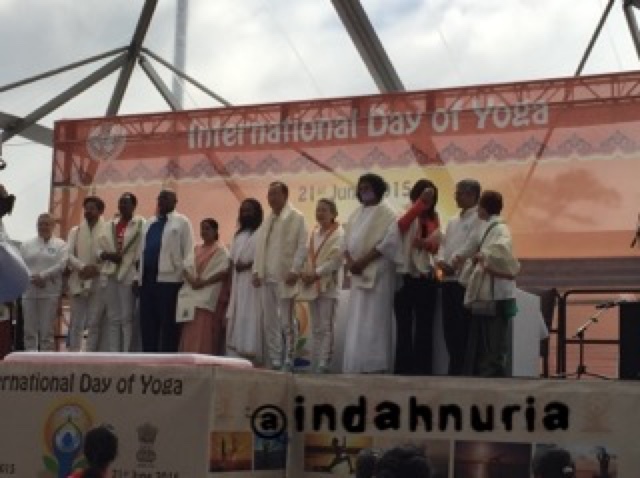 After that, we had the priviledge of having Sri Sri Ravi Shankar, one of the most renowned yoga gurus and the founder of the Art of Living, led us with some basic postures of yoga. 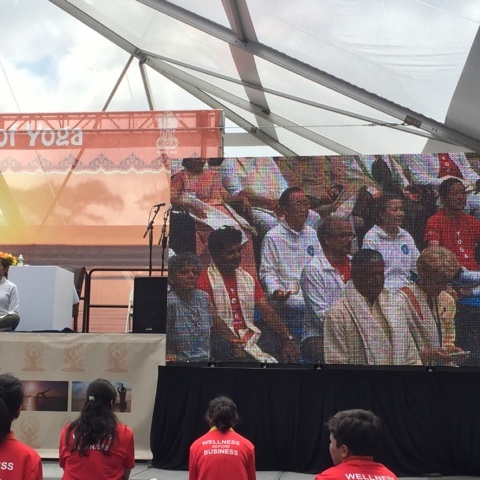 Even the UN SG and Madame Ban joined us on their mats :). It was a great celebration indeed. Although it was a sunny bright morning and Bo and I were fasting, but we managed to enjoy this light exercise which suited our Ramadhan day. As for me, I was introduced to yoga while I was studying in Melbourne back in 2007. Since then I have been a great fan, trying to work on it although I have some time off. I am still amateur for sure, but always enjoy my yoga sessions at home as well as with some friends and instructors, especialy after series of treatments that I have to go through with my breast cancer. It certainly brings health, peace and joy for me. 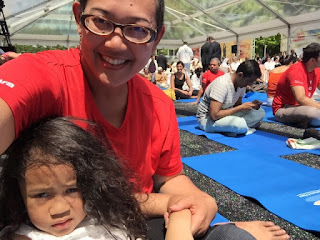 My hubby, Udi, ocassionally joins me and has the yoga session together. It's fun indeed.. So, do you like yoga as well? I took a few yoga classes. I tried really hard to like them, but just couldn't get into them. If my Zumba or Hip Hop class is full, I will try the Pilates/Yoga mix class, which I do like. I just find straight yoga too boring to work through for an hour. mixed class sounds great, Theresa...for me, Yoga is the best especially after my two major surgeries..
iyaaa mak...tapi memang pagi itu panas bangeet..
adaaa mak...tahun ini baru pertama kali dirayakan..
aaw... ga tega lihat muka Obi! Yes, my city has also been held with great success! I do like yoga. I don't go all the time, but enjoy it when I've gone. Mica and Isaak have a DVD that they do yoga to. What a cool event! 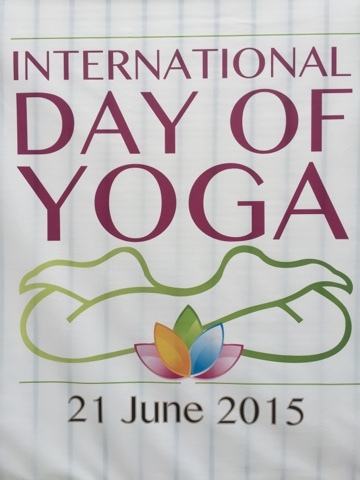 Especially for people who are into yoga! thanks for sharing, will definitely give some of those other stretches a go.